One of the more fun things to do during pregnancy is to test drive all the cool buggies and travel systems! We purchased our Maxi-Cosi car seat from Toys R Us just before they closed down a couple of weeks back and we decided to go with the pebble. So in my head I’m thinking ok, I need something that’s compatible with maxi-cosi. So I dropped Connor off at school and off we went to Mothercare myself,my mum, and my grandma. I already had the Icandy Peach in mind but thought no, I’m going to really do some research, see how easy they all are to put up and down and ask lots of questions to the staff. Once we were in there I grabbed an Icandy Peach to push around and a lovely member of staff came over to help. I explained to her that I needed something that was relatively easy to fold down and load in the car because I do have a 5 year old too so there’s no time to faff. First of all we had a browse of the Mothercare own travel systems- some of them aren’t compatible with the car seat we’d bought and the majority come as a complete travel system including there own car seats. They seemed easily steerable but for me they seemed quite bulky which I didn’t like. 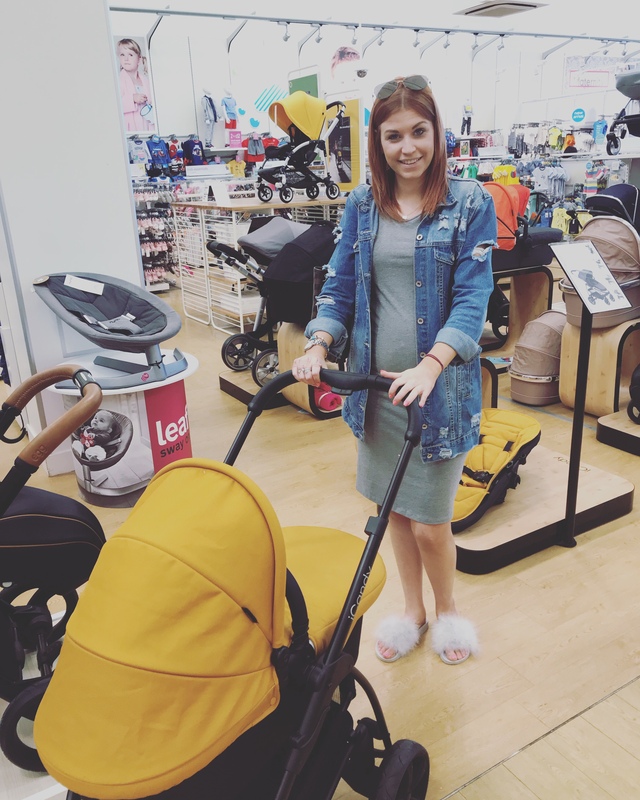 The Mothercare travel system range is very reasonably priced though starting at a cool £299 the Mothercare orb and Mothercare travel being the 2 travel systems that caught my eye. There was the Egg travel system that I really liked, it was edgy and looked very stylish but needs to be taken apart to fold down and load in the car. It has a few similarities to the Icandy which I liked but it’s started at £679 and you have to buy the car seat adaptors and travel cot separately so can come at a very costly price if your in need of the whole system! I had a very quick look at the Bugaboo systems but I’ve never been overly keen if I’m honest and they all seem a really weird shape? I don’t know maybe it’s just me, but I didn’t waste much time looking at these. I do know though they start from about £549. I would be lying if I said I wasn’t getting excited in the middle of Mothercare but the member of staff assisting us said her best feature is that the whole buggy folds down with the seat still attached!! Which means no fiddling taking seats off and loading the boot up. It all goes down in one! After I’d made my mind up that this was the system for me we asked the price and it was at £645. The pros outweighed the cons and we decided to go ahead and purchase it! To my absolute delight they said the colour I wanted it in would be delivered in store the next day so I didn’t even have to wait for it!! I chose slate grey fabric and the frame in chrome rather than Matt black. I absolutely love it and can’t wait to use it in August. I’ve told everyone if they see me strolling down the road with it to not be alarmed, I’ve not had the baby I’ve just become impatient! the 2 main reasons I was sold on this complete system was 1. It’s completely steerable and controllable with one hand which is handy if you’ve got another child’s hand to hold and it comes with EVERYTHING, and 2. Its sooooo light weight! It can fold down in one, be loaded into the boot easy and it’s a very popular make which is always a bonus! Can I also add that Mothercare Poole were just so helpful, we had a lovely staff member who couldn’t do more for us offering advise and demonstrations and answering any questions as best she could. Like I said delivery was so quick and the following evening myself and Mum were putting it all together ready to be stored with our other baby purchases!! So Mothercare definitely get a 5* rating from me hands down! I also noticed they do offer payment plans on a lot of the travel systems and buggies which can be very useful to some people! So if your expecting then go and have a test drive round Mothercare like I did, you won’t be disappointed! Let me know what you think and your pregnancy must haves in the comments!